May is special for me as it’s my birthday month. Traditionally we take the time to travel to places not as tourists but as curious travelers. This is when I go to a place specifically to explore art studios and galleries, eat interesting food, and look at real estate just in case we decide to change our home location. 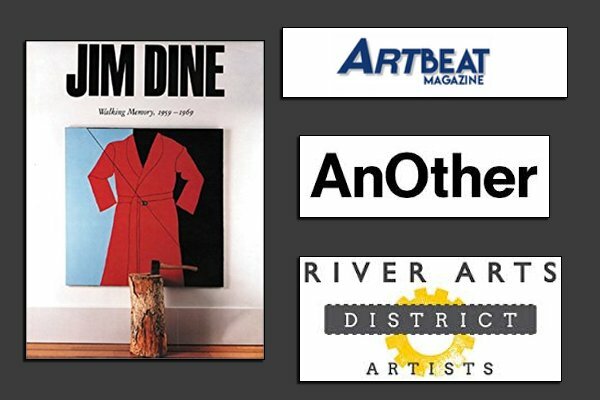 This year our main focus was on the River Arts District in Asheville, North Carolina. One of the artists in this open-air studio was more than pleased to explain the process and tools. On their “Around the Studio” page there are samples of students’ works, as well as a few videos of works in progress. If this art is on your list I would suggest you check out this studio. 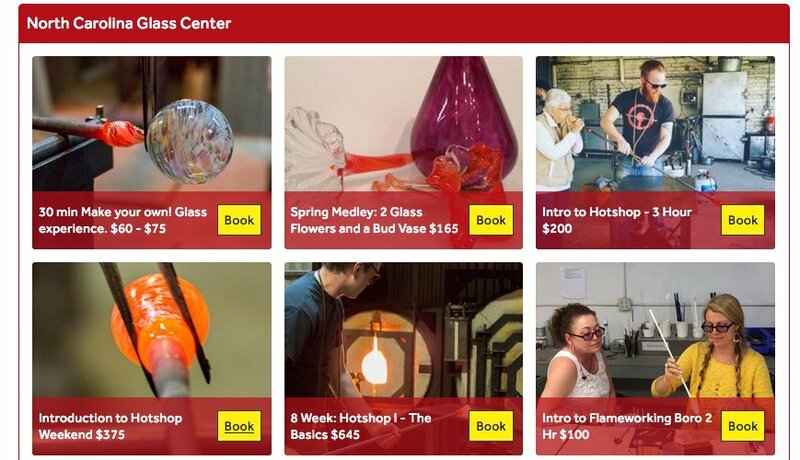 But remember it gets hot working with glass, so plan for an early class. I have collected art exhibition catalogs for years. Recently I have begun to add a collection of vintage digital art catalogs and thought that I would start sharing them. 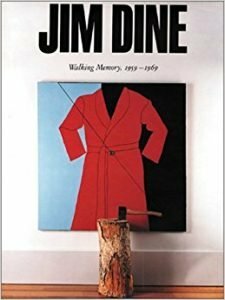 This one is Jim Dine: Walking Memory, 1959-1969. It was put together by Germano Celant, Clare Bell, the Solomon R. Guggenheim Museum, and the Cincinnati Art Museum. Jim Dine (b. 1935) is one of America’s best-known image-makers. This book, published to accompany the first major exhibition of Dine’s work from the 1960s, reproduces a broad selection of his early mixed-media works, paintings, and sculptures. Many of the works featured in this volume contain elements of the now-familiar themes of Dine’s career: tools, robes, hearts, palettes, and domestic interiors. Bringing together fascinating performance photographs with vivid full-color reproductions, the book is the first to explore the complex relationship between Dine’s mixed-media works and his environments and theater pieces. You can see it here. AnOther Magazine’s launch in 2001 heralded a new chapter in magazine publishing. Its blend of high fashion and world-class photography with features on the arts, politics, and literature continues to make each beautifully crafted edition a collector’s item. 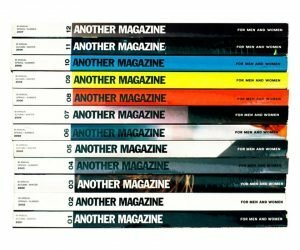 Published twice a year, it quickly established a reputation for highly original content brought together in its pages by an emerging set of photographers, stylists, and writers bound by a common search for creativity and authenticity. For Burberry’s S/S17 collection, Christopher Bailey drew upon the oeuvre of Henry Moore to sartorial effect, with clothes structured to mirror the curved and punctured forms of his renowned sculpture, alongside an exhibition at Makers House celebrating his work. The magazine combined those photos with a list titled Things You Might Not Know About Modernist Artist Henry Moore, covering everything from his humble beginnings to his rejection of a knighthood. I know there is something incongruous about using the word art and The New York Post in the same sentence but, hey, it’s no stranger them throwing a shark into formaldehyde and watching it dissolve. So when they came out with an article “The world’s hottest art spots, from a Montana mountain to a Swiss castle,” as a born and bred New Yorker, I just had to take a look. Take a look for yourself—it’s quite entertaining. I came across a new online magazine, ArtBeat, that says their goal is “to give our readers a fresh take on the arts and culture that surrounds us while keeping the stories strong and enlightening…encouraging our community to continue to support the arts.” The hard copy will be published twice a year starting 2017 in April and October, focusing on the arts and culture across the nation, without diluting the subject matter. 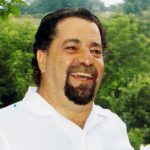 Check out their blog here, to get a flavor of what looks to be an interesting addition to the growing world of online magazines. Finally, a quick excerpt from the Kovels, the go-to source for collectibles and antiques since 1953. Forget anything today? An art dealer has what must be the record for the most expensive item lost this year. He was carrying a painting when he took a taxi in Paris on Thursday. He placed the painting in the taxi’s trunk, got into the taxi, was distracted by a phone call, and forgot the painting when he got out. He didn’t miss it until the next morning. The dealer tried to find the taxi but was unable, so he went to the police on Saturday and filed a report for a stolen painting. The police reported that the taxi driver had found the painting and brought it back on Tuesday. Either the taxi driver was very honest or didn’t realize the value of the painting: $1.6 million. 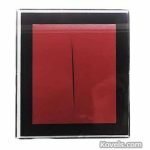 The Italian artist, Lucio Fontana (1899-1968), founded an art movement called Spacialism, paintings whose canvasses are pierced to create plays of light and illusions of dimension. Perhaps the holes in the canvas made the picture appear too damaged to be of any actual valuable.